Hay or haylage for a horse with ulcers? Getting forage feeding right. Forage is without doubt the most crucial part of any horse’s diet. It is more important than any other feed type, or supplement, and is often overlooked when planning a feeding programme or addressing digestive disorders. It’s all too easy to be swayed by the latest marketing for the vast number of specialist products on the market and to forget the basic and most essential aspect of feeding our horses. Which forage should I feed my horse? As most horse owners will know, horses will produce stomach acid continuously, but unlike us, only generate saliva whilst chewing. This means that, even a horse fed its entire daily requirement of forage, can suffer from stronger stomach acid if their forage is only fed over a short period of time, which can lead to ulcers. 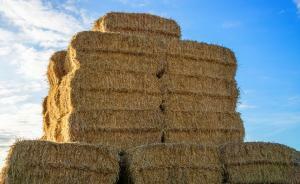 The three main forms of forage for horses are grass, hay/haylage and chaff. All forage will produce saliva from the process of chewing but the key is this: it isn't the source of the forage but the amount of time it takes to chew that matters, so the most important thing to remember is ensuring enough is fed and fed over the course of the whole day. Wherever possible, let your horse graze the grass in your paddocks. This encourages the horse to stretch its neck, allows for the correct alignment of their teeth for grinding and essentially it is the most natural thing they can do. Short chop forage, like chaff, has its benefits too as it takes a lot longer to chew than long forage like hay or haylage (weight for weight). This allows for more saliva and better protection for the horse’s stomach lining. Alfalfa has a naturally higher calcium content and this actively acts as an acid buffer on stomach acid. Alfalfa chaff (no molasses, low oil) will bring additional benefits and an even longer chewing time. It is now also possible to buy alfalfa haylage. Although haylage can have a higher nutritional value than hay, if good quality hay is in short supply it is better to feed haylage, and make sure your horse is getting enough forage in their diet, rather than providing a lesser amount of hay. Timothy hay/haylage is naturally low in fructose and can be a good option for those who have horses at risk from laminitis, and horses with EMS or Cushings Disease. A laminitis supplement like X-Lam Aid can also be beneficial in these cases. 'Produced' haylage, such as Horsehage, will have a nutritional analysis on the bag which will allow you to keep an eye on the levels of sugar and starch within the product. How much should I feed and how often? Horses require 2% - 2.5% of their body weight as dry matter intake per day - 2.5kg per 100kg of body weight, with an absolute minimum of 1% of body weight as forage. Because ulcer issues are becoming so common, you should aim for as much of that 2.5% as possible to be forage. This can be helped by using a balancer, such as Equilibra 500, alongside your chosen forage. Horses naturally graze for around 17 hours per day* so for optimum health we need to mimic these patterns as much as we can. The average 500kg horse should be consuming around 12.5kg of dry matter per day. 1kg of dry matter forage would be approximately 1.22kg of hay, 2.5kg of haylage and 4kg of grass (from grazing, not a bag). *The average grazing rate of grass is 0.5-0.6kg dry matter per hour, assuming sufficient growth is present. Split the total forage amount into portions spaced equally throughout the day/night, leaving no longer than 5 hours without forage to allow your horse the optimum feeding and grazing time. The less time your horse is without forage the better, and a horse with or recovering from ulcers should always have a source of forage available. If like most of us you have a busy schedule, multiple haynets can be a convenient way to spread the feeds as needed (or a haynet inside a haynet for the greedy ones!). If the overnight haynets (for those stabled) are empty, you need to provide more. Ultimately, don’t worry too much about the type of forage for your horse – the most important thing is to ensure enough is being fed and over a long enough time period so that the horse has plenty of opportunities to chew throughout the entire day and night.